Don Little in Hagia Sofia, Istanbul. Don Little will give a workshop on Understanding Islam and Loving Muslims, this Saturday (May 26) at New Life Community Church in Burnaby. In the meantime, here is the sermon he delivered at the church last Sunday, focusing on the unique importance of the Great Commission. Do you remember a time the last words you heard from someone you respect made a deep impression? I do. Forty years ago, as a 20 year old, I heard 80 year old Charles Marsh speak. Known as ‘the Apostle to Algeria,’ he had seen hundreds respond to the Gospel during his decades of ministry across North Africa. Yet, even though hundreds of people responded to his anointed preaching of the Gospel, most who believed through his ministry were martyred by their families right after they believed. Those words profoundly changed my life. Here in these passages we have Jesus’ very last instructions to the apostles. Surely, we would do well to pay attention to his final instructions. You shall love the Lord your God with all your heart and with all your soul and with all your strength and with all your mind, and your neighbour as yourself. This has often been called ‘the Greatest Commandment.’ New Testament scholar Scot McKnight, calls this commandment ‘The Jesus Creed.’ Jesus’ conviction that the entire law was summed up in one double commandment completely transforms the way we Christians view the Torah, and our vision of obedience to God. In the very beginning of human history, God gave humanity the responsibility to care for all that he had created! All of these amazing instructions and commandments are very important. They are all vital to our lives as Christians. Unfortunately, sometimes Jesus’ final commission gets lost among the many other important things he said, and the many other vital things that are taught in scripture. So often, we don’t really see or feel the huge priority that Jesus himself gave to this, his final commission to the apostles. Jesus travelled all over Galilee and Judea proclaiming the kingdom of God and teaching his followers for three full years before he went to Jerusalem to die. The crucifixion and the resurrection completed his mission, and after his resurrection Jesus give the apostles instructions about their mission. But he only had 40 days to communicate the nature and significance of the mission that he was now entrusting to his disciples. And during these 40 days, it seems that he only appeared to the disciples a few times. Yet, he made sure that they fully understood the task. Sometimes, we treat the five different texts, as if they were five different reports of the same conversation. But, upon closer examination, we actually see that Jesus was carefully spelling out the full dimensions of the task at five different times, spread over the 40 days of his post-resurrection appearances. On the evening of the first day, Jesus met with 10 disciples in the room in Jerusalem, and he gave the briefest of the commissions in John 20:21. Eight days later, when Thomas was present, Jesus showed up in the same room in Jerusalem, and gave the added information of Mark 16:15. Then about a week or so later, after the disciples had walked up to Galilee to meet Jesus, he met with them and gave the most detailed of the commissions, given on a mountain in Galilee, recorded in Matthew 28:18-20. 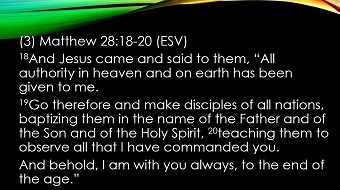 In most English Bibles, the heading “the Great Commission” appears with this version of the commission that Matthew placed at the very end of his Gospel. About two weeks after that, on the eve of his ascension, after the disciples had walked back to Jerusalem, Jesus gave the Luke 24:44-49 commission. Then, finally, probably just a few hours after the Luke commission, we have the account of Jesus’ final mission commission in Acts 1:8. Jesus wanted to ensure that there was no confusion, so he unfolded the task that he was giving to them in a step-by-step manner, over the course of almost six weeks! Let’s take a look at how Jesus spells out the key components in his commission over the five meetings in 40 days. In John 20:21 Jesus gives us the model. Just as Jesus was sent by the Father, now we are sent by Jesus. We are to minister the way he ministered, and we are sent to do what we see the Father doing, just as Jesus did. We are sent in the same way that Jesus was sent, and so Jesus becomes our model for ministry. Then in Mark 16, Jesus spells out the magnitude of his commission. Jesus makes it clear that we are being sent into the entire world to proclaim the gospel to all of creation. The magnitude of the commission is astonishing, even breathtaking! In Matthew 28, Jesus explains the method. We are to make those who believe into disciples, teaching them to do all that Jesus taught us to do. How do we carry out the commission? By making disciples of the nations! Note also that in Matthew 28 Jesus stresses that since he has been given all authority, then since he is the one sending us, then we undertake this commission with the authority of the Lord of the harvest, Jesus himself! When we served in Morocco, we served under the authority of Christ, even though the government of Morocco did not want the gospel preached! 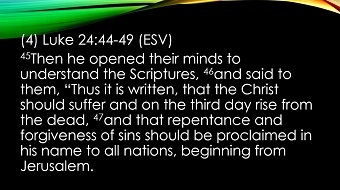 Then, in Luke, Jesus makes crystal clear what the content of the message is: the repentance and forgiveness of sins should be proclaimed in his name to all nations! What is the message? What is the gospel? It is the call to repentance that leads to God forgiving sins, so that the peoples of the nations can join with God’s ongoing work in the world! This brings us to Jesus final words, spoken as he began to ascend into heaven in Acts 1. He tells us how we will be able to do this. He gives us the means. We are to carry out his commission by the power of the Holy Spirit. It is rather encouraging, on this Pentecost Sunday, to remember that as Jesus gave us this massive mandate and completely impossible global mission to undertake, he also gave us the Holy Spirit to empower and guide us in carrying out his assignment! The other way that Jesus gives us the means, is by spelling out the strategy we are to use. We are told to deliberately focus on three kinds of geographic and cultural groupings. Sometimes we think Jesus was telling the apostles to start with Jerusalem and Judea, and after that, when all of Judea is reached, to move on to Samaria. Then, only after Samaria is fully reached, were they to move onto the Gentiles and to the rest of the world. Let’s think about what this means for us today. First, we are told to proclaim the gospel to Jerusalem and Judea; that is, to the strategic centres of our culture and nation. We are to proclaim Christ to the leaders and influencers in our nation. We are also commissioned to work in Samaria; that is, among neighbouring countries and cultures. We are called to help bring the gospel back to Canada and to Europe. And, we are also sent to go to the ends of the earth, to bring the proclamation of Christ’s forgiveness to peoples across the globe, to peoples who can never hear unless someone learns a new language and culture and brings Christ to them in person, face-to-face. This is the first reason that I believe that the Great Commission is still great. Because Jesus clearly made it his top priority. It was his final set of instructions for the church following his resurrection and the completion of his earthly mission! The second reason for believing that the Great Commission is still great, is that the apostles took Jesus’ commission very seriously! We all know that the apostle Paul left home and travelled throughout the Roman empire proclaiming the gospel and planting churches. Typically, the only other apostle that we remember as having left home to preach the gospel was Peter. We know that he went Rome even though this isn’t mentioned in the New Testament. The New Testament is silent about the apostolic careers of the 11. So, we tend to think that the rest of the apostles must have preached only in Judea and Galilee for the rest of their lives. But look at the map! 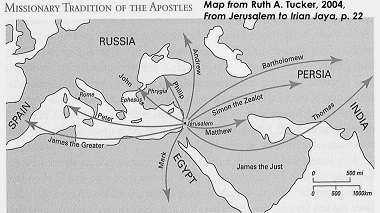 This shows the places that the apostles served according to various ancient church traditions. The only apostle who didn’t leave Judea was James, because he was martyred very early. The only apostle who was not martyred for proclaiming the gospel was John. Mark went to Egypt and Sudan. John went to Ephesus, in modern day Turkey. Philip went up to the Black sea area, north of Turkey. Simon went to Persia, modern day Iran. Bartholomew went to ancient China. Matthew went to Iraq and Iran. Paul and the 11 apostles travelled across the world proclaiming the gospel, as Jesus had commissioned them to do. They established churches that thrived hundreds of years, from Egypt and Ethiopia in Africa, to Spain and Britain in the west, to Persia in the north, and to China and India in the east. So, here we have the second reason for believing that Jesus’ commission is still great. The apostles believed it was great and they travelled to the ends of the earth in obedience to this great commission. Let me give you a couple of additional suggestions as to why I think that this commission is still stunning and exciting and empowering and great! First, God is still at work raising up men and women all over the world to carry out Jesus’ Great Commission, in their own communities (in their Jerusalems and Judeas), in their Samarias and to the ends of the earth. Let me introduce you to Philip, an apostle to his own people in his Jerusalem in India. In a conference that I attended in Thailand in October, there were 850 missionaries serving among Muslims from countries across the globe. I chatted over a meal with a 40 year old Indian man from the state of Gujarat, whom I will call Philip. Philip’s father owns half a dozen steel foundries across northern India. His family is wealthy and influential. His family has been Muslim for generations. While Philip was in his late teens, Jesus revealed himself; Philip responded and became a disciple of Jesus. His father was not pleased when he learned of Philip’s decision to follow Christ. After strongly seeking to persuade Philip of the absolute folly of his decision, his father gave him an ultimatum. “It is either your new religion or your family – you can’t have both.” Philip chose to obey Christ, and he has not been able to see his father since, nor has his wealthy and influential family helped him in any way. Following his conversion, Philip studied in a Bible college, and then a seminary in India, and then did another master’s degree in Scotland. In his studies he focused on understanding his own Muslim people and on figuring out how to help Indian Christians learn how to reach his people for Christ. About the time of his seminary graduation, God gave him a dream in which he saw himself in his own coffee shop in India. India is known for its tea shops, for its chai, but not for coffee. God used the dream to guide him, and following the completion of his studies, he moved to the States for a year and got a job in a Starbucks in order to gain insight into how a successful coffee shop is run. After a year, he returned to India, to start his own coffee shop in his home city. Many not-yet-believers come and ask if they can enter and watch the Christians as they pray and worship together. The guests often ask for prayer during the church’s prayer time; God answers their prayers and works in their lives. What’s more, Philip has helped others start an additional 15 coffee shops that are all flourishing in cities across the region. The are all owned, run and financed independently by local Christians, many of whom are converts out of Islam like himself. 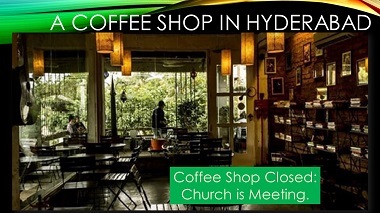 Their vision is to make their coffee shops into places where the gospel is shared and new believers are discipled. Dozens of Muslims across the region have come to Christ and are being discipled through this network of independent coffee shops. In Kenya, we in the Lilias Trotter Center are helping equip a network of local Christians who are responding to the Great Commission and have a vision of reaching the entire Muslim coastal region of East Africa for Christ. This network is the brainchild of Peter, a Kenyan missionary. Peter is a dreamer of dreams and a man of action. With very few resources, but a huge faith in God, he is seeking to mobilize and equip East African Christians to love and engage with Muslims. Thousands of Christians live in the Muslim coastal cities in Kenya, but they are not local. They all have moved to the coast for work from other parts of the country. The vast majority of them never even notice that they are surrounded by millions of Muslims and they don’t share the gospel with them. Peter is trying to change all that. He is seeking to inspire, mobilize and train thousands of these strategically located Christians to reach out to the Muslims in their Samaria, right where they live. Why is the Great Commission still great? Because God is still at work calling and sending 21st century apostles! The Great Commission is also still great because God is powerfully at work today bringing Jesus to Muslims! Never before, since the birth of Islam in the 622 AD, have more Muslims been coming to faith around the world than now, in this 21st century. This past June, during a visit to Beirut, Lebanon, I visited several local ministries that are serving and loving many of the thousands of Syrian refugees in Lebanon. Muslim Syrian refugees in Lebanon are responding to the compassionate ministry of Christians, and to the proclamation of the gospel. 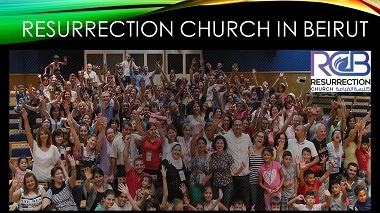 Many of the evangelical churches in Beirut are bursting at the seams. Why? Because Muslim refugees are searching for answers, and Christians are boldly serving and loving them, and sharing the gospel with them. In both 2015 and 2017, I visited a local Baptist church, called Resurrection Church. They used to be a small church of 50 believers, all of them from Christian background. As of last summer, they had about 1,000 members, in three congregations, and the majority of them are former Muslims who have come to Christ – they are Syrian refugees. The church is flourishing and they are involved in discipling more than 2,000 people! God is at work drawing people to himself in some of the toughest regions of the world, and when we obey the Great Commission, we are joining him in his work! The Great Commission has truly become the mission of the Global church. Now, I suspect that what I have said may have raised some questions in your minds . . . So, if the Great Commission is so important, what are we do to about the Great Commandment? Isn’t it important to care for peoples’ physical needs? And what about caring for the planet and transforming communities? What about the Creation Mandate? How do these commands fit with the Great Commission? Are they less important than the Great Commission? I have wrestled with questions like these for most of the past forty years! Eventually, I have found that a helpful way to understand this begins with a step back to look at the grand sweep of the biblical narrative. In Genesis 1-3, God created humans, and put them in the garden of Eden, and he intended them to be stewards of the entire earth, of all of God’s handiwork. Unfortunately, the deceiver entered the Garden and turned humanity away from their God planned purpose, and as a result, ever since, the peoples of the earth have most often not known or honoured God, nor been in harmonious relationship with him. So, God set in motion his mission to redeem people from every tribe, tongue and nation and restore them to the transformative, loving relationship with their creator intended from the start. That plan began with the calling of Abraham, in Genesis 12, and concluded with him sending Jesus to be king, and he set up his eternal kingdom and then sent the apostles to announce this kingdom to all the peoples of the earth. Today, in obedience to Christ’s final commission, as the gospel is proclaimed and people believe, churches are formed among people groups in new cultures and language groups. Once there are believers among a people group, then they, empowered and transformed by the Holy Spirit, begin the transformation of their own communities and nations. They reach out to the needy in compassion. They obey the Great Commandment in their communities, and they also obey the Creation Mandate and learn to care for God’s creation where they are, too. They also respond to and obey the Great Commission and in turn, they send their own missionaries to their Jerusalem, their Samaria and to the ends of the earth! But, until there are people in every language, tribe and nation who have responded to the gospel and begun to worship the living God and serve him by the power of the Spirit, the task of Christ’s Great Commission continues. One last question that some of you may be asking: Is every follower of Jesus Christ a missionary? We often hear it said that every Christian is a missionary. When we reach out to our neighbour, no matter where we are, then we are a missionary. However, the term ‘missionary’ is really another word for ‘apostle.’ An apostle is someone who is sent out. As we have seen, Jesus’ great commission strategy was to send the apostles to proclaim the gospel to the ends of the earth. In the New Testament, prior to the Great Commission, the 12 were always called the disciples. But, after the ascension and Jesus’ commissioning of them, they were called the apostles. The disciples became the apostles, after they were commissioned by Jesus to go and preach after the resurrection. If we have been called by God and sent out by God through our local church to proclaim the gospel, then we are “sent ones”; we are missionaries. In the New Testament sense all who are sent out to proclaim the gospel are missionaries, or apostles. The rest of us are disciples, who faithfully carry out the Great Commandment and the Creation Mandate where we are. We are not all missionaries, but the church in every generation is called to send out apostles, to send out missionaries in obedience to the Great Commission. The Great Commission is to be obeyed by every generation of Christians in every part of the world. We must continue to proclaim the amazing good news of forgiveness from sins, and joyous life with God now, to those nearby and to those living far away. Christ’s Great Commission is still in force. This awesome task that has yet to be completed. So, what does this all mean for us? Living the Christian life is always a challenge, and we are bombarded with more and more appeals urging us to fight on behalf of the latest cause. I hope that we can again see afresh that the Great Commission is the priority task for the church in every generation. It has sometimes been said that “when everything is missions, nothing is missions.” If we all think of ourselves as missionaries, then the importance of sending some as apostolic heralds of the gospel will be lost – because it is clearly impossible for all of us to go! We will be confused as to Christ’s priority for the church and for us, we will be unable to accomplish Christ’s commission. So, let us make the Great Commission great – keep it the church’s priority, here at New Life, for yet another generation! Don Little, DMin, is a missiologist with a large international Christian NGO. He is a writer and editor who travels widely in the Muslim world as a consultant and trainer. 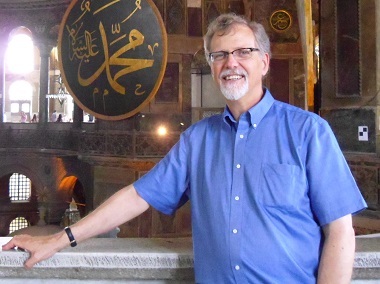 He also teaches the Christian study of Islam at Houghton College. He wrote Effective Discipling in Muslim Communities: Scripture, History and Seasoned Practices (InterVarsity Press Academic, 2015).